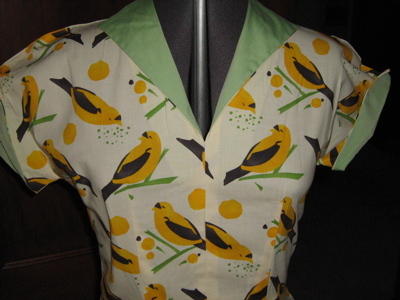 Do you remember that bird fabric I was moaning about missing? And how y'all helped me find some (I bought five yards from CraftyPlanet, which, if you remember, was the place that featured the sock monkey dress in their windows). I can't remember (or find, in my messy sewing room) the patterns I used — it was another bodice-from-one, skirt-from-another Erin Special Combo, though. When I dig them up I'll post them. 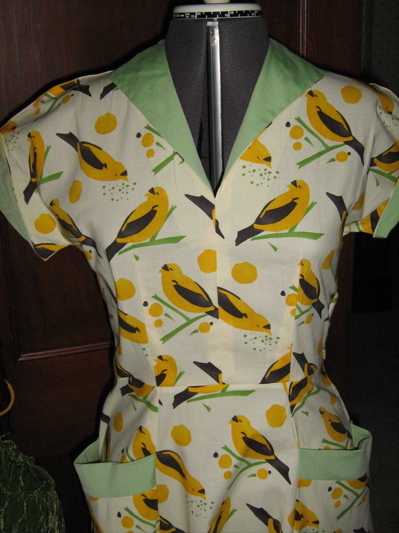 At first I was a bit dismayed by exactly how much it looked like the waitress uniform at a diner called "Birdland" or "Nettie's Nest", but the more I thought about it, the more pissed off I was by my own first reaction. How sad and telling is it that clothes that remind us of honest labor (and let's be honest: low-paid, female honest labor) are somehow less beautiful? Why is is denigrating to say that a garment looks like the uniform of a waitress, or a nurse, or any other female service job? Why is the ideal to look as if you've never done a lick of work in your life? Why are clothes that actually facilitate Getting Stuff Done less worthy than clothes that actively Get In The Way (stiletto heels, I'm looking at you)? Anyway, after getting myself comfortably indignant (it's good for the liver) I resolved to wear this happily, and if anyone points out the entirely-fortuitous resemblance between this and the traditional uniform of the great American waitress, I will pull a little pad out of my (convenient) pocket, take the pencil stub from behind my ear, and write them a thank-you note. After which I will continue on my merry way, working. Being an Aussie and not having any experience of diners, I just thought it was a great practical day-dress with a late 40s/early 50s feel!But if it DOES look like a diner waitress uniform, your solution is PERFECT. And thank you notes are an under-represented from of courtesy these days. I love work dress. I have worn them for years to do “work”. Sometimes people will say the funniest things like ” I love dresses but I can’t wear them because I have to work too hard.” I just kind of roll my eyes and keep on working :). We all need more opportunities in life to say, “Kiss my grits!” and this dress provides the perfect vehicle!Too cute. Not that I care about the matching up of the front or not (I didn’t notice it until I saw it mentioned and went back to check) but 5 yards, being about 5m I believe, is a lot of material, and I believe you could easily make it match at the front in 5 yards – unless the material is really narrow. Maybe that would explain why Erin seems to buy such large amounts of material? I think it’s the contrasting collar n cuffs, as well as the capacious pockets (also trimmed to contrast) that give it that waitressy look. Not that there’s anything wrong with that! A good waitress is a thing of beauty (person of honor?) in my eyes. You could go whole hog and wear it with apron, name badge, hairnet and white sneakers and I would applaud loudly (and ask you for some iced tea!) 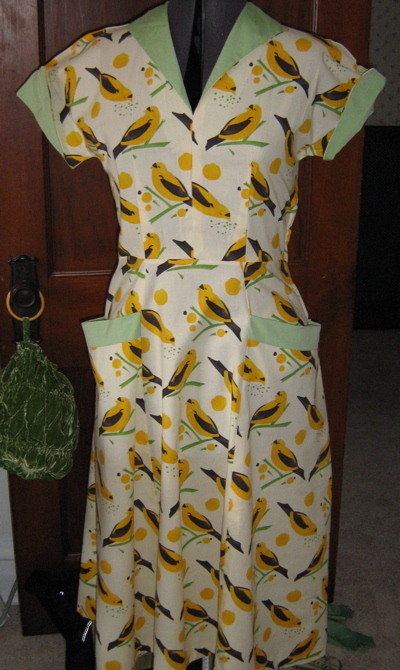 To keep it looking less uniform-like I’d go for canary yellow kitten heels and mint green bakelite jewelry: fun! AH I LOVE THAT!! I hate dresses but even I would wear that! OMG, Erin, that dress is spectacular and I never once thought waitress. And, as you point out, nothing wrong with that, at all. In fact, it would be a little refreshing to see a waitress in a dress again, wouldn’t it.